Evan Frendo’s two day, 20 hour, course was aimed at experienced trainers. On the 26th and 27th January it summoned 12 like-minded ESP trainers, eager to learn and share ideas with each other, from Berlin, Frankfurt and Leipzig. We were all keen on finding out in whether this workshop was going to improve our ‘efficiency, effectiveness and profitability’ as promised. Reflecting back on what happened during those 20 hours I think it is safe to say that Evan delivered what he had promised, providing a plethora of useful insights as well as practical tips and ideas that we can start using and implementing straight away. The course was spread over two days. On Saturday we had a slow start as some of the participants had difficulties getting to the venue for 9am due to problems with BVG, but this had no negative effect as Evan cleverly engaged those who had arrived on time in our first interactive activity that newcomers could easily slide into. By the time all 12 of us were there the room was buzzing with chatter as we got to know each other happily sharing details about our careers and experience. This was an excellent introduction to the first session and topic of our course – The Language of the Workplace. This was followed by a 90-minute long session on Needs Analysis, Teaching lexis, and Using corpora, with two coffee breaks and an excursion to a local restaurant for lunch in between. On Sunday we started at 9am with another 90-min session on Authenticity, followed by another two 90min sessions on Intercultural Communication and Persuading the Client. Again coffee breaks and lunch were integrated into our schedule and the day ended with a session dedicated to Feedback and an end-of-course discussion. Each session was packed with valuable insights and ready-to-use classroom activities. Most people seemed to find Needs Analysis extremely useful as Evan shared some of the methods that seem to uncover the real needs our Business students have. There was talk of using frameworks and anecdote circles, for example. However, as one session followed another, it was hard to choose the best one – they all had something worth hearing about, even things that we may have known or used before were examined from a fresh new perspective and given a twist. For example, most people have used Corpora one way or another, but Evan shared some tips on how to take it a step further and make it an almost must-have tool for ESP. The unit on Authenticity discussed the use of genuine material from real life versus authentic documents provided by our students. Personally I found the biggest surprise in the part where Evan guided us through things ESP teachers should know about Intercultural Communication. Here he shared his tips on teaching students how to build relationships and the language of impression management. Finally, we ended the workshop role-playing and simulating negotiations with a client, which seemed to be a really fun way to end the workshop. We then wrapped it up by sharing our final thoughts. Evan’s style of leading the workshop helped us all enjoy ourselves while learning new things that I am sure all of us will put into use very soon. Not just the presentation, which dazzled, as most of us were seeing a presentation in Prezi for the very first time, but Evan’s interactive style kept us all invigorated throughout the day. All in all – if you were not there this time – make sure not to miss it next time! 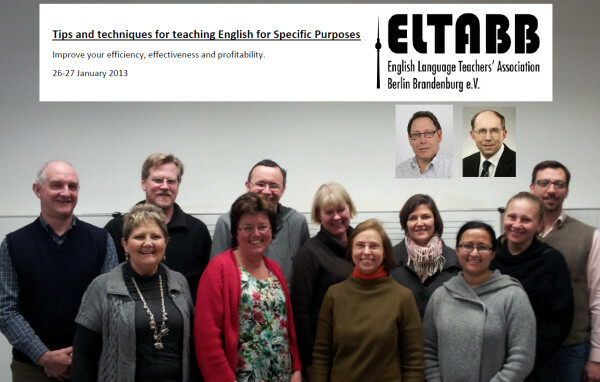 This 2-day seminar is part of a series of compact professional development courses provided to ELTABB by leading trainers in EFL and Business English. The last such 2-day course was Carl Dowse: A Teacher’s Digital Toolkit, 15/16 September 2012. Coming up: Judith Mader and Rudi Camerer: Intercultural Competence in English (ICE) Train the Trainer, June 8/9 and 15/16, 2013.